I feel so grateful and happy right now. I have my baby twins by egg donation. Thanks for everything, they grow up healthy and start learning walking now. My heart full of love whenever I hold my babies. This is the feeling of happiness I am eager to have. 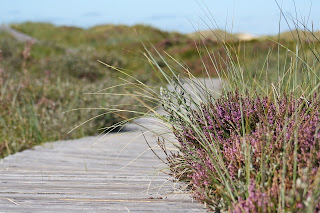 Due to Premature ovarian failure, I gave up having a baby long time ago. However, I still tried infertility treatment for 3 years after I got married. Unfortunately, it did not work, soon and later, we decided to have egg donation treatment. We were anxious about everything, but the only thing we knew was the law of donor program in Taiwan is mature and trustable. At the same time, we mailed to two different fertility centers in Taiwan. We got a warm and friendly reply from Celine who worked at Stork Fertility Center. The thing we were worried about was language because there were fewer people in Hsinchu who could speak Japanese than in Taipei. Luckily, we felt better after visiting the Stork Fertility Center which was bright and clean. In addition, we felt relieved and comfortable after seeing our specialist of Stork Fertility Center, Celine, who was always there for us with kind smile. Compare with the experience in Japan, Stork Fertility Center is better and everyone in here is much nicer. Because of that feeling, I believed in I would have a baby and bring he/she home with their assistant. After listening Celine’s detail explanation of egg donation treatment, we decided to match an Asian egg donor. We completed all the required procedure and then we went back to Japan waiting for the match result. After 3 months, the perfect egg donor was found and the surgery was successful as well. As I went to Taiwan again, I transferred two embryos. After this step, the Stork offered lots of warm service, like meals and taxi for sending me back to hotel sooner. Finally, it's the day that for pregnancy test. Yes! I was pregnant. The dreams come true. It’s been 8 months since I contacted the Stork. I was very lucky everything went well when I was pregnant. And I delivered the twin babies as 38th weeks. Both of them are very health. Although I didn’t feel they looked like me, I still thought they were cute. I don’t think I’m pretty, so egg donation treatment is a much better option for me. Wish you all the best. Never give up! With the Stork Fertility Center, you must be happily after. There are some women are infertile due to the ovulation function failure, common reason include congenital under-developed ovary( e.g Tunner syndrome) ; premature ovarian failure (e.g due to infection, surgery, immune system or medication treatment, cause the premature ovarian failure). And some women are carrier of chromosome disease, for example hemophilia, using donated Egg can really help to slove the problems. Where are the Egg come from ? Most girl donating oocytes aim to help people, few of them are patients doing IVF, end up getting more oocytes that she need, so donation can be an option. Miss Y was doing IVF, but because of she suffered from Polycystic Ovary Syndrome‎(PCOS), end up getting more than 20 oocytes, more than she needed.So she froze the rest and donated to others. According to the Taiwan governments’ Assisted Reproduction Act, “Assisted reproduction institutions shall not provide reproductive cells donated by a single donor to two or more recipient couples at the same time” Personal information of the donor and the recipient shall remain confidential, we can only provide donor’s health condition, heigh, weight, blood type, skin color.. mainly objective description to recipient couples for reference. 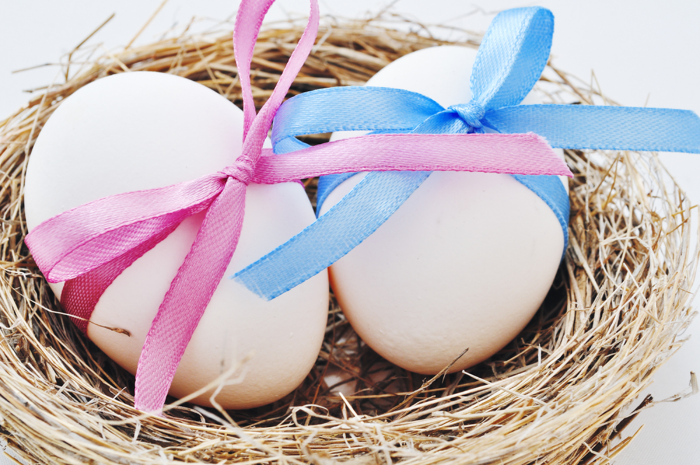 women at least 20 and less than 40 years of age, has never donated Egg before. Other than hereditary disease from the family and chromosomal abnormality , history of epilepsy and hemophilia, we do blood test on infectious diseases, such as mediterranean anemia, diabetes, hepatitis B, gonorrhea, syphilis, AIDS, etc. After passing the blood test and checking the qualification with the government, donor can start treatment from menstruation cycle day 3, using medication for around 10 days, egg are becoming more mature. 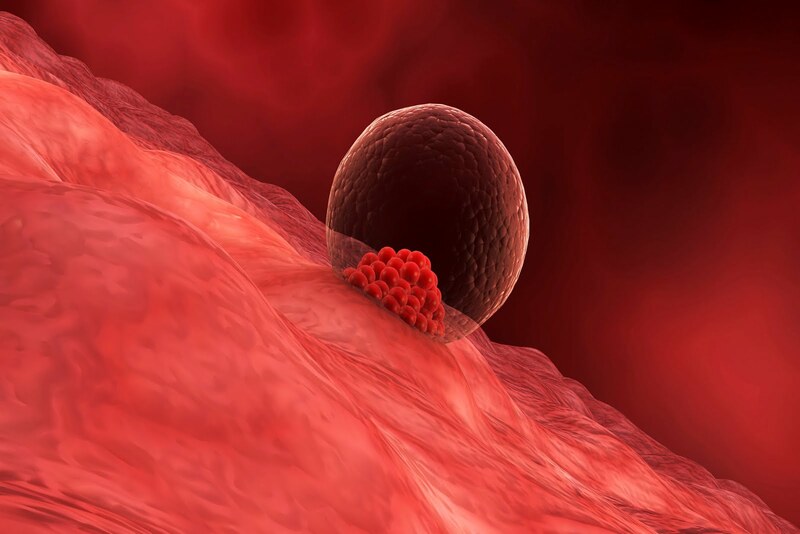 Throughout the procedure, we monitor the growth of egg using ultrasound and blood tests. Around cycle day 14, egg-pick-up surgery will be arranged, under anesthesia. The surgery last 10-15 mins, after 1-2 hours rest, treatment is completed. 1. Very few people ,around 1%, suffer from Ovarian hyperstimulation syndrome( OHSS) after the surgery ,symptom include : abdominal accounts, poor appetite, decreased urine, shortness of breath, vomiting, etc. 2. Young women have hundreds of thousands of egg available stored in the ovaries, and donating dozens of egg will not cause early menopause. the endometriumis smooth and no Edema at both fallopian tube. Then will start medication at day 5 of your cycle. Prepare the best environment for embryo to bed. Will my kid look like me? There are half gene of the kid are from the father, half are from the donor. As for the matching process, the priority will be the blood type. Then we will according the criteria that you make for the donor, try out best to find a perfect donor for you. Positive. Vitrification is a common use technology at crypreservaion of oocytes and embryos. Vitrification is a cryopreservation technique that leads to a glass-like solidification. Oocyte, embryo and blastocyst freezing by vitrification method for cryopreservation have been used for many years beside sperms preservation. 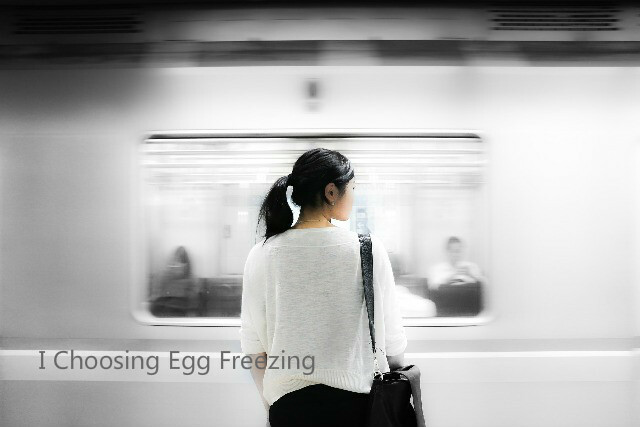 Moreover, the use of vitrification technology for ovarian tissue cryopreservation to freeze eggs offers such an elderly women who sometime find more difficulty in conceiving or in maintaining pregnancy till full term because of old age compared to relatively younger women who might get better chances to get a healthy pregnancy. Furthermore, vitrification helps cancer patients who are looking to preserve their fertility later on after completing their treatment. I’ll be 39 in 2 months. interested in it. Therefore, I held back from thinking this thought. treatment is only 110k which is affordable for me. Stork you could trust it, enjoy the professional service and lasted equipment. In IVF, we’ve been discussing the ideal thickness of endometrium for implantation. Besides, is the criteria the same for both fresh blastocysts and frozen-thaw blastocysts implantation? Will it be the same? We did not have many studies on the above issue. 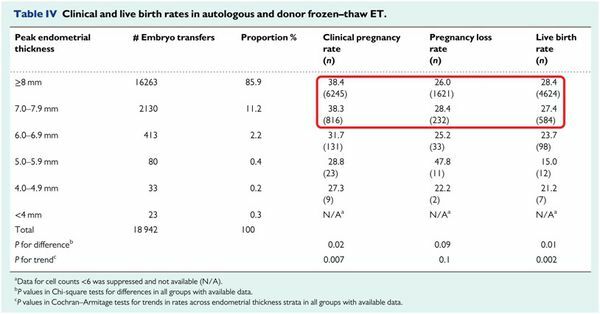 This September(2018), Human Reproduction, a research team from Canada, using the database of local IVF treatment, analyzed over 40 thousand implantation cycles of both fresh blastocysts transfer(BT) and frozen-thaw blastocysts transfer (FBT). A result had been found: Clinical pregnancy and live birth rates decline as the endometrial thickness decreases below 8 mm in BT and below 7 mm in FBT cycles. As shown in the study,in the BT cycle, the pregnancy rate for endometrium thickness ≥8mm is 43.2%, the abortion rate is 22%, the live birth rate is 33.7%. Comparing to the statistics of thickness. In FBT, the pregnancy rate of endometrium thickness≥7mm is 38.3%~38.4%, the abortion rate is 26~28.4%, the live birth rate is 27.4~28.4%. Comparing to the statistics of thickness. With a good uterus environment, comes with a better clinical outcome. Good things are worth waiting for. Hum Reprod. 2018 Sep 17. 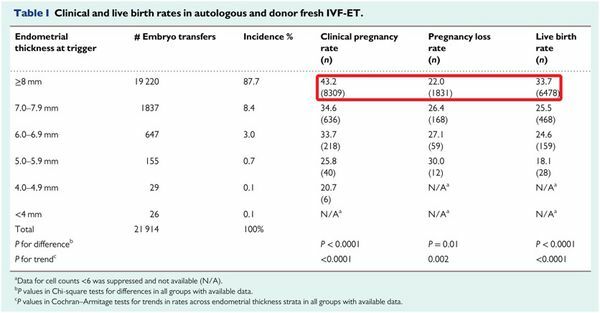 The impact of a thin endometrial lining on fresh and frozen-thaw IVF outcomes: ananalysis of over 40 000 embryo transfers. Liu KE, Hartman M, Hartman A, Luo ZC, Mahutte N.